Its sort of just the outershell and lining sewn together, plus a few fabric covered buttons. To say the truth, I dont even remember what I was trying to make before the transformation! Have you ever made something that took its own course? This entry was posted on Sunday, March 21st, 2010 at 11:48 pm	and tagged with fabric button, sewing, skirt, wool and posted in finished pieces, mistakes, sewing. You can follow any responses to this entry through the RSS 2.0 feed. « Petite Republic Give Away– big circle circle dress! Oh yeah! When I start making earrings, what I end up with is always so different from what I imagined. I don’t know about you, but I find it very therapeutic =) Love your skirt btw! I like the flare at the bottom, the length on you and the fabric-covered buttons! Oooo.. I’m glad you’re keeping it. The skirt looks wonderful on you! I.LOVE.THIS.SKIRT. I’m really hoping you change your mind about it and wear it often. 🙂 So did you draft it entirely yourself, or just kind of alter a commercial pattern (which one?)? That skirt is soooo cute. It looks great on you. I once tried to make pandan chiffon cake but it ended up being just pandan cake without the chiffon part when the whole cake slid out of the pan and deflated. But it was still really yummy! 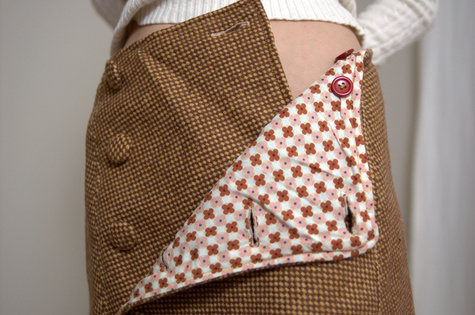 This is a gorgeous skirt, and a neat design! Did you draw up a pattern for it? How can I get a copy of it, or something similar? thank you! unfortunately this was a different skirt design that failed. so i sort of experimented and cut off fabric to make this one. so no patterns!